Cover a wide variety of control applications with the T7350, Honeywell’s most advanced commercial programmable thermostat. It’s fully featured for installation and setup ease, user-friendly operation and reliable, long-term performance. And the T7350 communicating models can integrate with building automation systems. 365-Day Programming – The T7350 offers 7-day programming and allows up to 10 holidays to be programmed throughout the calendar year. Remote Sensing – Indoor, outdoor, humidity, discharge air and occupancy are all T7350 remote sensing options, depending on model. 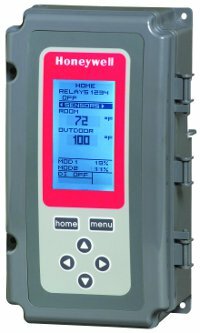 Dehumidification Control – The T7350 D, M and H models have an integrated humidity sensor for 5 different methods of dehumidification. Microprocessor Controls – Honeywell’s famous accuracy to within 1° F of setpoint virtually eliminates temperature deviation. Intelligent Recovery™ – This energy-saving feature automatically selects the optimum time to begin warm up or cool down. Intelligent Fan™ – The option to choose intermittent or continuous fan operation during occupied time makes it easy to regulate air exchange, ventilation and energy use. Some controllers require you to piece together separate modules to get the control features you want, and those added relays can, well, add up. So can the added LCD display, an added transformer module and more. The Honeywell T775 Electronic Standalone Controller puts an end to add-on costs. All the features you need for a variety of applications are built right into the T775, including the LCD display. You won’t have to worry about having the right modules in stock or needing to piece them together. The T775 has it all. Easy-To-Use Graphical Interface — Operating the new T775 is as easy as operating your cell phone. The easy-to-use, intuitive programming will save you time on every job. Internal Time Clock Scheduler — The Setback and Disable Output options, controlled by the built-in scheduler or digital input, will help save energy during unoccupied times and give you more control of the equipment without needing to purchase an additional time clock. Up To Two Independent Modulating Outputs — Each output can be individually configured for 0-10 Vdc, 2-10 Vdc, 4-20 mA or Series 90, so a single device can handle many field requirements to save you time selecting the right control for the job. NEMA 4X Enclosure Option — Certain models are offered with NEMA 4X enclosures to protect them from water and corrosion. They can be installed in animal confinement areas, green houses, washdown areas, swimming pools and other similar locations, giving you the control you need for harsh locations. Modulating High Or Low Limit Control — If you need to protect your coil from freezing or your equipment from overheating, models offering this feature give you the ability to adjust your control temperature at sensor A to protect equipment at sensor B. You get consistent control while still protecting your equipment. Optional Configurable Integral And Derivative Times — Standard on every device, this feature delivers pinpoint control. PI or PID control on modulating outputs is set up by default to behave just like the previous T775 Series 1000, but now you can adjust reaction times and behavior, giving you more control. Reset Models With Simplified Setup — Reset programming has never been easier. Simply enter the high and low control temperatures and the corresponding high and low outdoor temperatures, and you’re done. As your outside temperature gets colder, the setpoint temperature automatically adjusts to save energy. Configurable Minimum Off Time — If needed, setting a minimum off time can protect equipment and reduce the need for a separate time delay device. Sensor Calibration — Calibrate input sensors up to +/-10° F. This can be used to compensate for resistance drops in wire leads, to offset the input temperature for sensor location and more. Fewer Models — Fourteen T775 models replace 38 Series 1000 models, so you’ll reduce inventory and eliminate the headache of trying to choose the right model.